Heraldry is the practice of devising, granting , displaying , describing or recording a coat of arms and heraldic badges. The correct term is actually “Armoury” as the real meaning of heraldry is the “Art or office of a Herald” – over time we have added the term Heraldry to cover the science and Art of the Hereditary symbols which form the Coat Of Arms. A rather fascinating subject which has its origins back in Ancient times. The Romans decorated their shields with patterns and markings however these were for decoration and associated with military units, not individuals or in the medieval sense. The coat of arms developed during these Medieval Times……… When the warriors starting wearing armor and helmets, the warriors face was usually obscured and identities were unknown on the battle field. Kings, Barons and generals could not distinguish between the soldiers. Distinguishing devices were used on surcoats (‘coats of arms’) , shields, and even horse coats. It became an extension of the banners and seals and helped formalise their armies. During this time when the vast majority of people could not read or write and many different dialects were spoken, coloured symbols emblazoned on Flags, Armor and Shields served as markings so that the soldiers could be identified. The more developed and stylised or extended coat of arms helped distinguish the accomplished gentlemen, Knights and Nobility, from the common man or peasant. 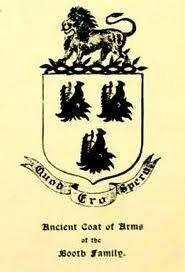 The Coat of Arms and family crests are testaments to the bravery or merit of the family or ancestor that has earned it. The coat of arms served many important functions such as the Motto which was either a well known trait or belief of the original bearer, or was used as a battle cry when going into battle. The Booth Motto is Latin “ Quod Ero Spero” – and literally translated means “what I hope to accomplish , I shall accomplish” in other words “Hope, Perseverance, Success”. A motto that as history has recorded many of the ancestors have lived by. Note the boar was considered a charm against injury in battle. 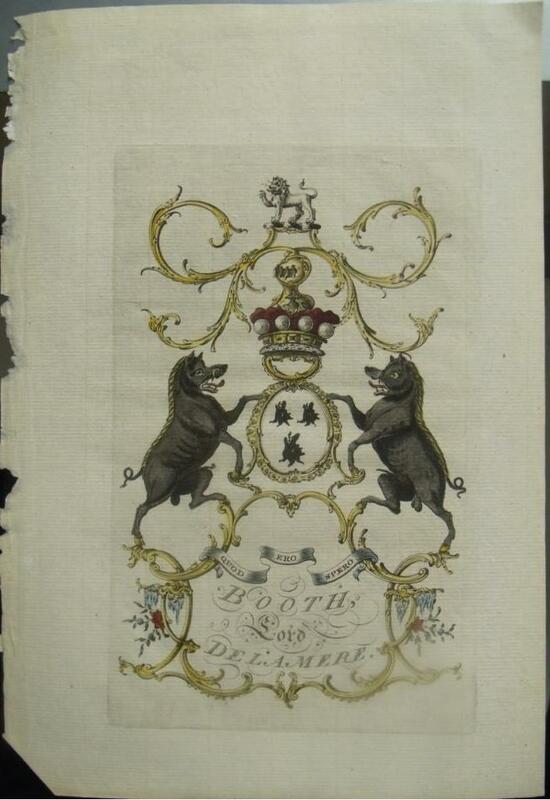 The boars head serated and upright – a symbol of Hospitality. Original manuscript from Jacobs Peerage published 1769. 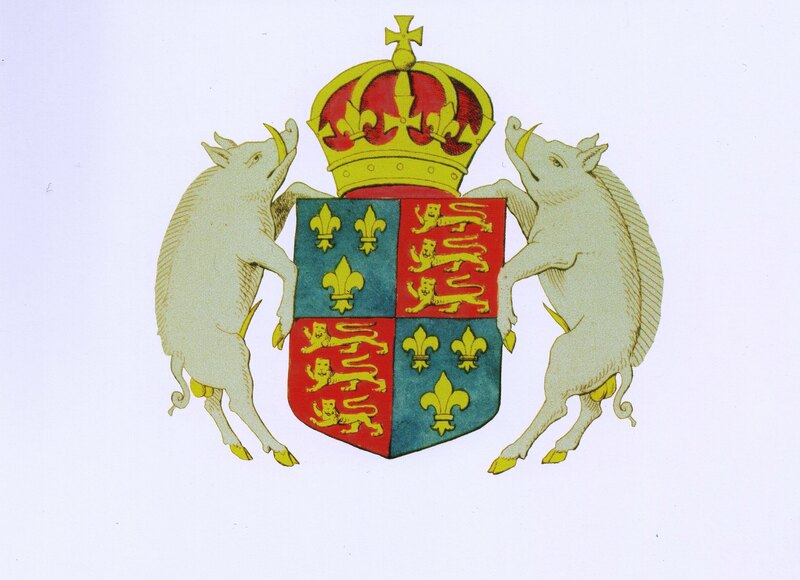 Note: This Armorial creation is a variation on the early Booth coat of arms with some important stylizing, it shows the inclusion of the Boar Supporters, The Escutcheon (shield) is lozenge style containing the 3 boars heads – also includes mantling which is a symbol of the Knights cape. The family motto has remained the same after 400 years. The Earls Coronet (crown) cradling the knights helm (helmet) , The family crest, a Passant (Lion) representing warrior or chief and also representing the heraldic symbol of the King. Many people refer to the coat of arms as a family crest, this is incorrect, the crest is the figure at the very top of the Armorial design. As the lion is the crest on the Booth coat of Arms. A more versatile method is quartering, division of the field by both Vertical and horizontal lines. This practice originated in Spain after the 13th century. As the name implies, the usual number of divisions is four, but the principle has been extended to very large numbers of “quarters”. Quarters are numbered from the Dexter chief (the corner nearest to the right shoulder of a man standing behind the shield), proceeding across the top row, and then across the next row and so on. The quarters of a personal coat of arms correspond to the ancestors from whom the bearer has inherited arms, normally in the same sequence as if the pedigree were laid out with the father’s father’s … father on the extreme left and the mother’s mother’s … mother on the extreme right. The Scottish and Spanish traditions resist allowing more than four quarters, preferring to subdivide one or more “grand quarters” into sub-quarters as needed. 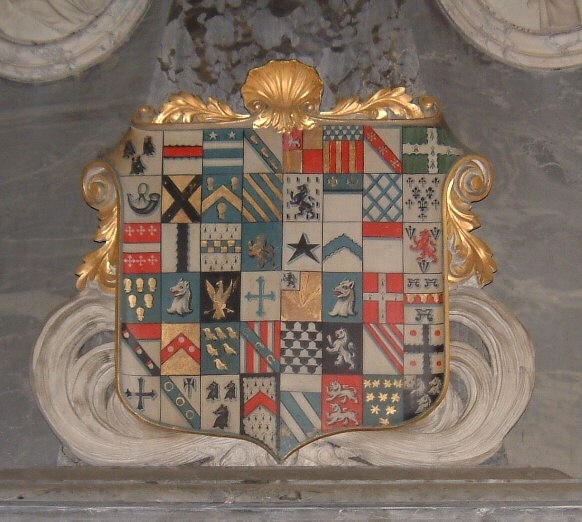 The Heraldic memorial in Bowdon Parish Church below is for Henry Booth, 1st Earl of Warrington, and his wife Mary – nee Langham. 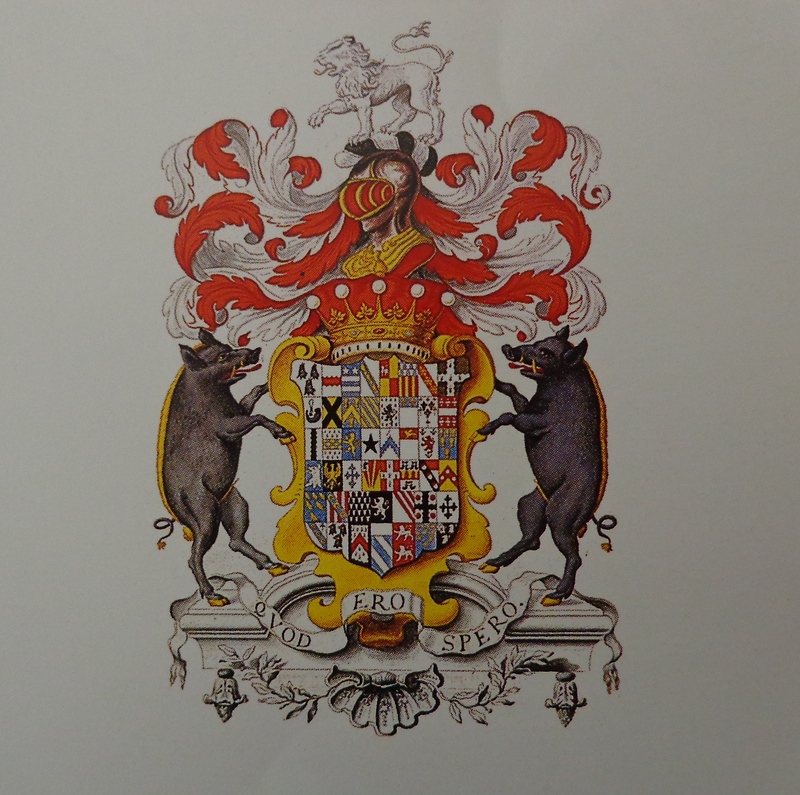 The following Quartering show the respective coats of arms identifying the family bloodlines ……………………. to be checked and added soon. They can be seen in the Dunham (or Booth) Chapel at Bowdon Parish Church. A hatchment or a memorial monument is a distinctive rendering of a dead person’s arms, represented on a shield shaped frame This feature is enough to indicate that the rendering is a funeral hatchment, but there are often other clues. The crest may be replaced by figurines, angels or cherubs or a floral treatment and the motto by the word “Resurgam” (I shall arise) or a latin script or as shown above using mantling. Hatchments have now largely fallen into disuse, but many hatchments from former times remain in parish churches, especially in England. These Booth memorials can be seen in the Dunham (or Booth) Chapel at Bowdon Parish Church. 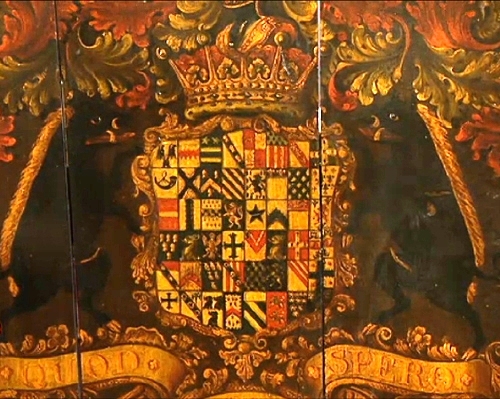 Valued by the Antiques Road Show’s Elaine Binning at between £12′500 to £15′000, the panel, said to date from 1694, is inscribed with the words ” The South Side of Mottram Chancel is repaired by and belongs to the Earl of Warrington, as Lord of the Manor of Staly”. Mottram Church is in the village or Mottram between Stalybridge and Glossop. King Richard III (2 October 1452 – 22 August 1485) was King of England for two years, from 1483 until his death in 1485 in the Battle of Bosworth Field. He was the last king of the House of York and the Last of the Plantagenet dynasty. His defeat at Bosworth Field, the decisive battle of the Wars of the Roses, is sometimes regarded as the end of the Middle Ages in England. He is the subject of the play Richard III by William Shakespeare. The Royal Arms of England – In 1376, the kings of France altered the royal coat of arms, replacing the field semé-de-lis with three fleurs-de-lis, alluding to the Trinity. This new design is referred to as France Moderne, the previous one being France Ancient. I have a lot more to add in this section ….. particularly the coats of arms of many of Carolyns direct descendants such as the De Vernon, De Beauchamp, as well as some French and Spanish bloodlines. “Ferrer” is Norman French and means “to bind with iron” or ” to shoe a horse” (cf. farrier). Ferrières-Saint-Hilaire in Normandy, the hometown of the de Ferrers family, was an important centre for ironwork. The Ferrers coat of arms shows eight black horseshoes on a silver background. More ancient arms show only 6 horseshoes. Today we know a farrier is a specialist in equine hoof care.